The University of Minnesota professor speaks on campus on Oct. 13 about immigration crises. Headlines speak of migration crises across the world and of undocumented immigrants crossing borders closer to home. 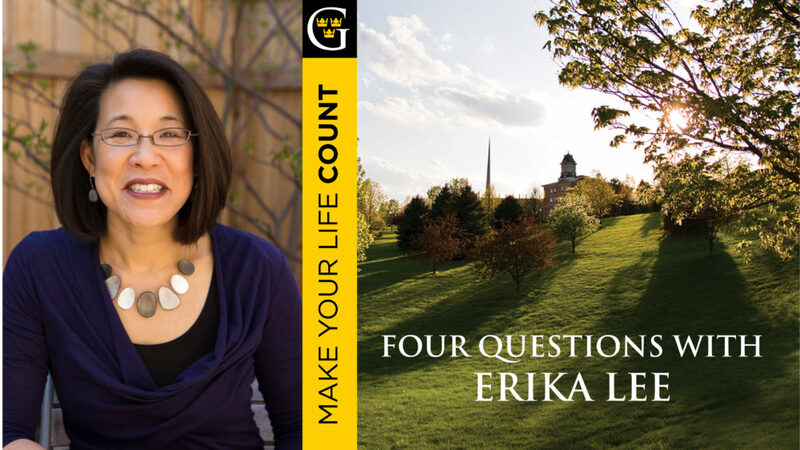 Author, historian, and director of the Immigration History Research Center at the University of Minnesota Erika Lee challenges us to look to the past, drawing parallels between United States history and the current global crisis, asking us to avoid making previous mistakes again. Lee will talk on “The First ‘Global Immigration Crisis:’ History and Contemporary Issues” on October 13th, from 7 to 8:30pm in Alumni Hall, sponsored by the Department of History. Her most recent book will be available for purchase: The Making of Asian America: A History was named a Best Nonfiction Book of 2015 by Kirkus Reviews and the 2015-2016 Asian/Pacific American Award for Literature in Adult Non-Fiction by the American Library Association. Gustavus: How does a historical perspective on Asian immigration help us navigate current immigration issues in the U.S.? Erika Lee: Today’s debate over immigration is so divisive that we tend to forget that we, as Americans, have always had a very complicated relationship with immigration. On one hand, we like to think of America as a “nation of immigrants” that has welcomed foreigners and helped them create new lives for themselves. On the other hand, we have shut our doors to countless immigrants and singled out entire groups for exclusion. Chinese immigrants were the first, in 1882, when the U.S. passed the Chinese Exclusion Act. By the 1930s, all other Asian immigrants were barred from entering the U.S. as well. The global debates over Chinese immigration—what I call the “first global immigration crisis”—transformed our entire immigration system and helps us remember what is at stake when nativism and xenophobia direct public policy. Gustavus: How can we understand immigration on a global scale through studying Chinese immigration? Lee: There are record numbers of people on the move around the world right now, and in that sense, global migration is an issue that affects every region of the world and is much larger than the migrations of Chinese during the late 19th and early 20th centuries. However, anti-immigrant sentiment seems to be growing and upending national and international politics, just like the earlier period in world history when Chinese immigrants were barred from most immigrant-receiving countries. Gustavus: How can we reframe our ideas of immigration to hold less negative connotations and fear tactics? Lee: We need to better understand the forces behind global migration—war, persecution, global inequality, poverty, and climate change. Most people do not want to leave their homes and families for lives of uncertainty, hostility, and separation in a foreign land. They are being driven out by forces beyond their control. We also need to remember that behind the headlines describing the alleged problems of immigration are real people with hopes, dreams, and family members. Gustavus: What can students and others do to learn more about immigration crises? Lee: Everyone has a story to tell. Let’s tell our stories. I’m so proud of the Immigrant Stories project that the Immigration History Research Center at the University of Minnesota has established. We help immigrants and refugees create, share, and preserve their stories about immigration for future generations.We’re taking the project around the country this year and to Europe this summer. Learn how to make your own story by visiting our new story-making website. And check out our collection of more than 200 stories, representing over 45 different groups.